Even with all of the new marketing channels that have opened up over the years, AdWords is still the core of many companies interactive campaigns. If your PPC campaigns are not running efficiently, it can have a drastic impact on your bottom line. 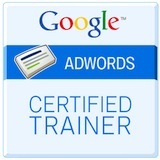 Join Brad Geddes for a full day of AdWords education and discussion that will teach you not only the best practices, but also advanced concepts and strategies that are based upon a decade of research and testing. The absolute center of every PPC campaign is keywords. We’ll start this section by correlating keywords to the buying funnel and examining the user intent. While keywords are the lifeblood of PPC, perfecting your match types usage while controlling your negative keywords can drastically increase your overall revenue. We will cover how to organize your account based upon match types, positive, and negative keywords. There’s a reason it’s called AdWords, Bing Ads, and Ad Groups. The only part of your account that a searcher sees is your ads. Impression share shows you how often your ads are displayed and gives you wonderful share of voice data. Quality Score is a diagnostic tool that can help you understand improvements that your account needs. In this session, we will demystify quality score, show you how to analyze and improve it; and then use quality score and impression share data to determine how to increase your account’s effectiveness. Audience targeting is should be part of PPC workflow. We’ll examine display remarketing, remarketing list for search ads, customer match, and demographic targeting to cover how these features work. Then we’ll show how to create advertising strategies for your account that combines audience targeting data and other AdWords features together to fine tune your customer acquisition strategy. Do you want some examples of what has worked for other companies? In this rapid-fire case study section, we will quickly cover several case studies that will give you new and interesting ideas of what you can do with your AdWords accounts. Conferences are fantastic places to network and meet fellow practitioners of online marketing. Lunch will be provided so you can spend time getting to know your fellow attendees. Brad Geddes is the Founder of Certified Knowledge, a company dedicated to consulting, educating, and training marketers on Internet marketing theory and best practices. Not one to hold secrets, Brad is a prominent educator in the PPC industry.